This Saturday brings round three of the Sapphire Series hosted by the current leaders the Teesside Steelers. Rivals Chester Romans are hot on their tails and it’s all still to play for in this conference. The reigning Teesside Steelers will certainly be looking to maintain their undefeated record on home turf this weekend. Teesside are undeniably the team to beat in this conference and have put on spectacular performances from both offence and defense so far. Not only that, but we feel it’s worth mentioning the great sportsmanship shown by this team. The Steelers play nothing short of classy football and win games the honest way. Teesside have no doubt been great this season, however if we cast our minds back to Sapphire 2016, this is an all too familiar story. The Steelers maintained the lead in their Division Two Northern Conference until the very end when the title was snagged by the Edinburgh Wolves. With two more rounds to go, nothing can be certain just yet! The Steelers will need to take home two wins this weekend if they want to be in with a chance to compete for one of the top spots in the conference. But Sandwell have arguably the toughest fixtures this Saturday facing the current top two teams… Round three will be a Herculean task for this Midlands team. On a high after their two wins from their home tournament, the Chester Romans will be hoping for a repeat performance this round. Chester have established themselves as contenders for this conference title following their win against the Sandwell Steelers in round two. Saturday the Romans rematch Sandwell and face the rookie Peterborough Royals. If Chester can secure two wins this will almost ensure their position in the conference, meaning they can fight it out with Teesside for the top. 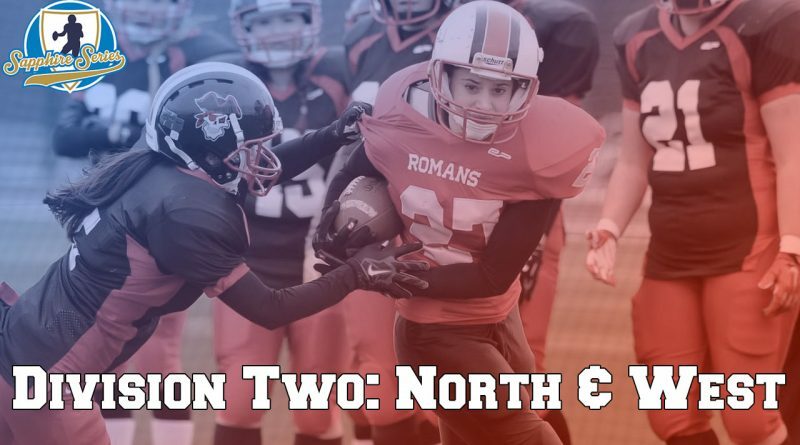 However the Romans brutal offensive scheme has yet to flummox the seasoned Teesside in this series or any previous Sapphire for that matter… Chester will have to work hard if they want to be in with a chance for the title and defeat the Teesside Steelers. This round welcomes the Peterborough Royals for a cameo appearance in the North & West conference. The Royals swap places with the Cardiff Valkyries in an attempt to reduce the amount of travel for both teams. Whilst the geographical perspective is understood, both these teams will have a challenge on their hands facing not-before-seen teams.